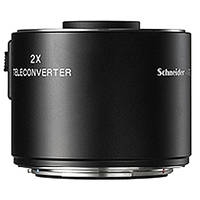 Effectively doubling the reach of AF-mount lenses, the Schneider Kreuznach 2x Teleconverter is a versatile and compact option for increasing your apparent focal length. Dedicated to the Schneider Kreuznach 240mm f/4.5 and 150mm f/3.5 leaf shutter lenses, this teleconverter produces extended focal lengths of 480mm and 300mm, respectively. Regardless of the lens in use, this teleconverter requires manual focusing operation and also reduces the effective maximum aperture by two stops.